This 8,000 square foot student center and sanctuary was built in Blacksburg, VA to the European Passivhaus energy standard. It is the first student center to be certified under the Passivhaus standard in North America. The building will use 90% less energy than an average building of its type, and approximately 65% less than a code building. Building commissioning was employed to certify the aggressive Passivhaus air leakage requirement of < 0.6 air changes at 60 Pascals. Most of the year heating and cooling for this building will be provided by occupant and lighting heat, and a small solar hot water heating system. 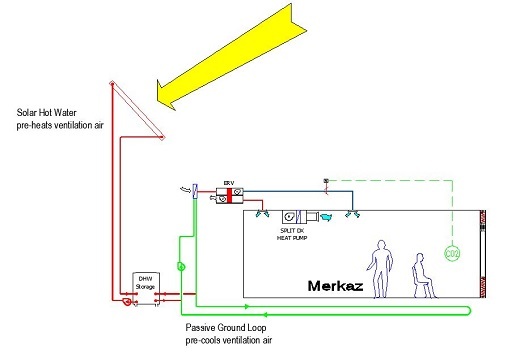 Base load cooling will be supplied through a passive ground loop that pre-conditions ventilation air. During periods of high occupancy, a cost effective heat pump system provides cooling and dehumidification.